Thanks to the variable resistance with flywheel training, the kBox biceps curl is not depending on the lever hence restricting the force-development throughout the whole exercise. Speaking in non-science terms, a kBox biceps curl will never make you stop unless due to fatigue. Use the kBar or the kGrip accessories. Do traditional concentric-eccentric 1:1 curl with the kBar in high tension all through the range of motion (ROM). 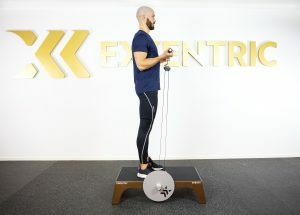 To do an overload, use legs in the concentric phase to overload the exercise (overloaded concentric action), this will be a challenging strength exercise from the waist and up. Shift between grips to do hammer curls or reversed grips curl. To see this exercise done on the kPulley, click here. Go back to exercises, or read more about the applications of flywheel training.